Alpha 1 Legal Services provides clients with a positive, proactive investigation service. Many repeat customers are testament to the quality of service we provide. We have been providing investigation, surveillance, process serving, tracing and bug sweeping services for many years, and can provide a wealth of knowledge and experience spanning over 20 years. We are contractors to Legal Professionals, Government Bodies, Commercial Industry & the General Public. We are fully Data Protection Notified. We hold Professional Indemnity Insurance up to £250K, and our MD holds a current Disclosure and Barring Service (DBS) certificate. 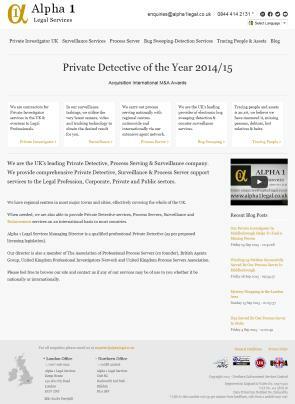 For Private Investigations come to the experts - Alpha 1 Legal Services. Alpha 1 Legal Services provides a full range of Investigation Services. Headquartered in County Durham, Alpha 1 Legal Services operates throughout Northern England (Carlisle, Durham, Lancaster, Middlesbrough, Newcastle, Sunderland) and Northeast England (Barnsley, Bradford, Chesterfield, Grimsby, Hull, Leeds, Sheffield, Wakefield, York). Alpha 1 Legal Services has operational capability throughout the UK and internationally.